The EoK -- sharing its door-opening, opportunity-creating kindness-based skills and courtesies with every young person in the US -- and beyond. The Etiquette of Kindness believes that every young person is important and each one deserves a good chance at a better life, no matter her/his background, ethnicity or personality type. 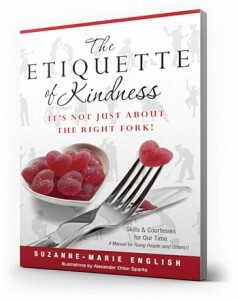 The Etiquette of Kindness is a movement that began as 15 years of donated classes for 6th, 7th & 8th graders, teaching young people of diverse backgrounds the supremely important "soft skills" -- all the aspects of communicating and relating in today's world. In Dec., 2012, its mission outreach expanded considerably when, added to the ongoing donated classes, it became a book used by teachers, parents & others devoted to young people. The EoK provides its skills to young people via its ongoing donated classes, teacher support and gifts of The EoK manuals to libraries, teachers, and educational entities across the U.S and beyond.